‘A fine beer may be judged with only one sip…but it’s better to be thoroughly sure’ is a Czech proverb that seems perfectly apt for a day dedicated to all that’s great about beer. 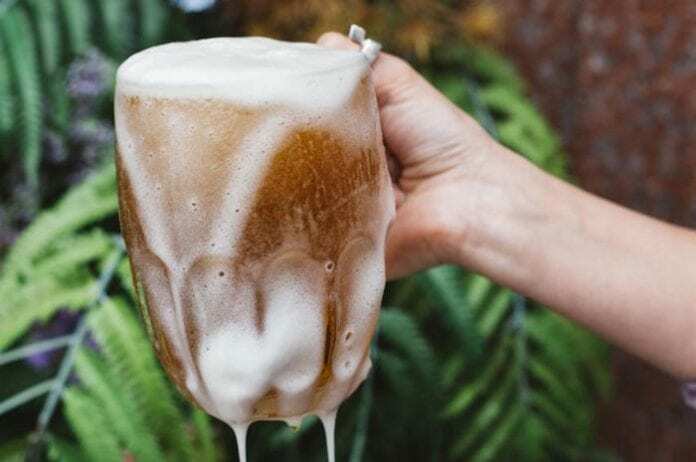 For the last ten years, the first Friday in August has marked International Beer Day, a time for devotees to honour all that’s great about their favourite tipple – and maybe the sceptics to find a beautifully crafted beer to suit them. 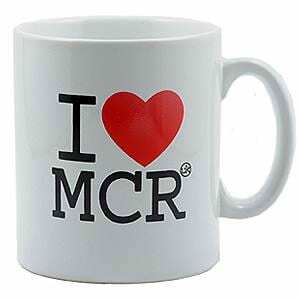 Whether you’re looking for something homegrown or from further afield, here’s our pick of the best places to raise a bottle, glass, tin or tankard in and around Manchester. But please remember. A beer isn’t just for International Beer Day. 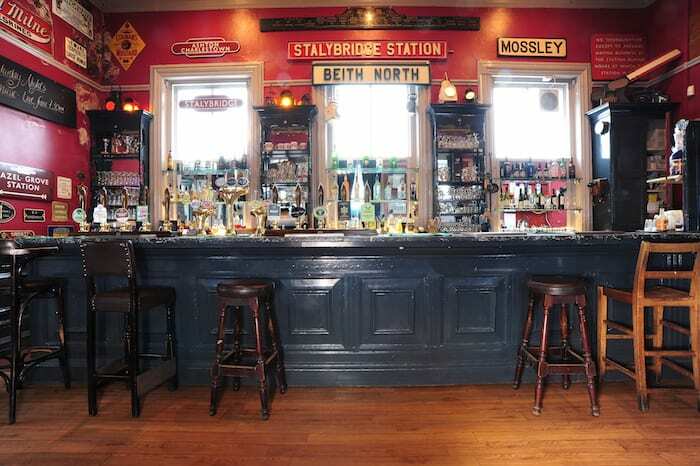 The charm of this pub is that you can sip a pint while watching the steam engines come and go because it’s situated on the platform of the historic Bury Bolton Street Station. Inside this traditional pub you’ll find a small but bustling bar that’s known for its constantly changing selection of real ales from local breweries. A favourite stop-off for those enjoying the East Lancashire Railway, it’s also close enough to Bury town centre to pop into for a swift half. 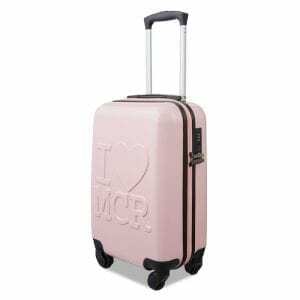 This means it can get busy but there’s plenty of seating inside and out to ensure you’ll find somewhere to settle. Café Beermoth emerged nearly three years ago following the success of the Beermoth beer shop in the Northern Quarter. Alongside tasty cheese and meat boards, the cafe showcases an ever-changing selection of beers from all around the world with a strong focus on independent American, Belgian, Scandinavian, and British breweries. The team believe there’s an ideal beer for everyone and host talks and tastings throughout the year. Look out for the monthly collaboration with Cheese Club MCR; the Danish Het Uiltje Tap Takeover on August 17; and the return of the Bottle Club, where staff will guide you through rare, classic and forward-thinking options. Taking up a sizeable chunk of Peter Street, this cavernous place, with its lengthy bar and tongue-in-cheek décor, gets its name from the party palaces of Bavaria. It’s not understated or traditional, but you can still have a relaxing drink – especially if you’re lucky enough to nab one of the stools around the fire (even during the summer months). The team pride themselves on their selection of beer, including the original Pilsner Urquell, tap options such as Black Jack L’Eroica Pale Ale and Menabrea and the fruit juice topped Albert’s Radlers, inspired by the German cyclists who didn’t let the matter of competing stop them from sipping a cold beer. If you’re searching for a spot of time travel with your tipple, take a trip to the Stalybridge Buffet Bar. 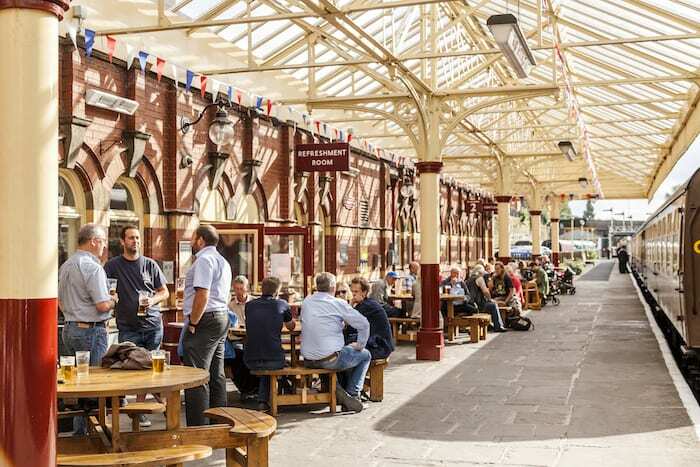 Part of the Transpennine Real Ale Trail, the bar dates back to 1885 and is located in the middle of platform four at Stalybridge train station. It’s no surprise it’s popped up on television numerous times and only recently appeared in the Guardian’s top 10 of best stations cafes and bars in the world. What it lacks in gloss and glamour, it makes up for in character and lots of memorabilia. 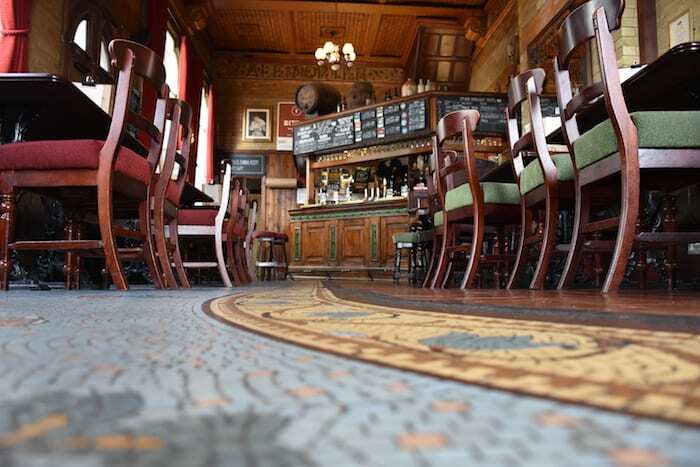 Prop yourself up at the original marble-topped bar or take a perch in what was the First Class Ladies Waiting Room to enjoy a selection of beers from local breweries such as Stockport’s Thirst Class and Salford’s Pomona Island. 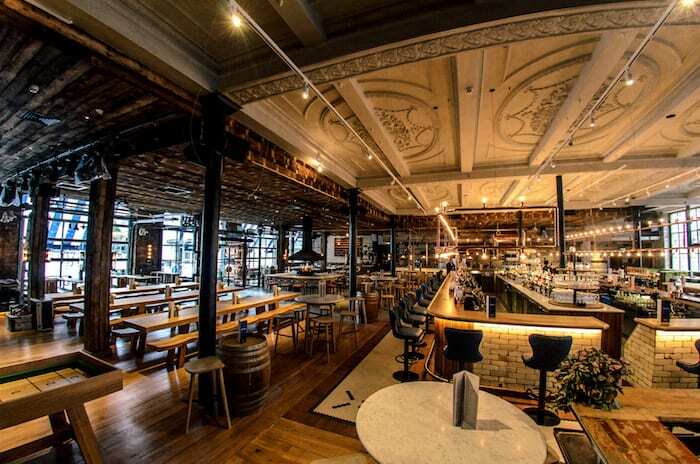 This place has got a lot to live up to given it was voted Best Pub at the Manchester Food and Drink Awards last year, but a visit to this Grade II listed establishment won’t disappoint. A stunning pub with lots of period detail, this is still considered a hidden gem despite the plaudits. 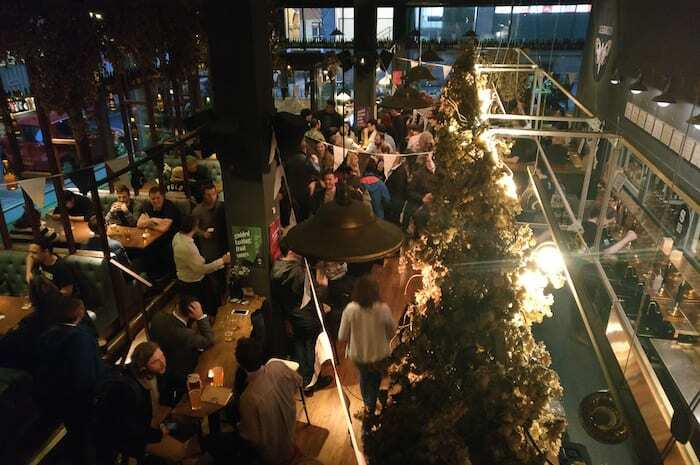 The company has its own microbrewery, Marble Brewery, and there’s a range of beers on offer including the core selection such as the pale ale Pint and Manchester Bitter, as well as cask ale and keg beer options which are a combination of their own and guest beers. Menus are designed with the beers in mind so just ask one of the staff if you need help choosing. Cloudwater’s only been going a couple of years but it’s already established itself as one of the world’s best breweries – second best, in fact, according to RateBeer. 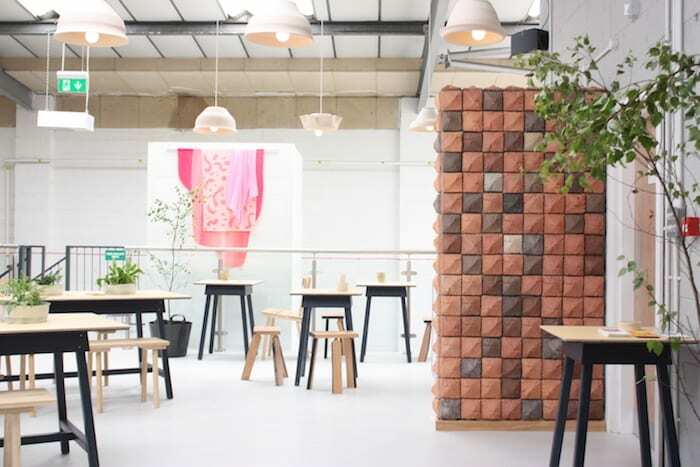 In response to the ever-growing interest, the company’s just opened a new taproom called Unit 9 next to the brewery in the once bleak wilderness behind Piccadilly Station. Beer lovers can now sit, on a ‘first come, first seated’ basis, in the light and minimalist Scandi-feel space and sip any of the 20 draft lines and cans direct from the chilly four degree source. Crayfish, cruffins and coffee: is this the best brunch in the city?